A Road Less Traveled: Rain, rain, go away. I am sick. Sick, sick, sick. Have been for a few days, but it seems to be getting worse instead of better. Today I took some Mucinex (it’s an expectorant) and it really got me coughing. Like, for over an hour straight. My stomach was in spasms afterward. Wouldn’t be that big of deal if we weren’t leaving for China NEXT WEEK. I have a thousand and one things to do to get ready and all I feel like is lying in bed and drinking OJ. My house is getting messier instead of cleaner. Argh. In a family our size, we have lots of birthdays. That means lots of parties for me to plan. We've always had parties at home (going somewhere or renting things is so expensive) and so they take a lot of effort. I’ve begun to simplify in the last couple of years. Parker has taken friends to the dollar theater for two years in a row-- easiest party ever. And last August, we had a combined party for Taylor, Jessica, and Graci. Their birthdays are within a month, and we were getting ready to travel to China (for Xander) so we were especially busy. We were able to rent an enormous blow-up movie screen for half price and set it up in our backyard. I figured we could splurge since we were combining parties. We played fun games in groups of older kids and younger kids, divided into three groups to open presents, then combined together to have ice-cream sandwiches and popcorn while watching a movie outside on blankets and lawn chairs. It was perfect. Beautiful weather, tons of happy kids. Three birthdays in one night. Score. We decided it was worthy of a repeat this year. Each of the three birthday kids invited around 15-20 kids. Yes, that’s a LOT of kids—but since the party was going to be in the backyard, it seemed fine. Until the dark clouds started moving in. Yes, after setting up the giant screen, it began to rain. And rain. And rain. Kids started showing up at the house. Jeremy and I were both in a bit of a panic mode, but there was nothing we could do. Sadly, I had not worried about getting my house all ready and clean, because I thought we’d be outside the whole time. I had to send all of the big kids (Graci’s and Taylor’s friends) downstairs to our messy family room (play room) to play games with Jeremy and I kept the littles upstairs. The problem was, not only were we severely crowded, all of the games we had planned were outdoor games. Requiring lots of space. What could we do but laugh? Well, I’ll tell you. We could feel stressed and ornery. That’s kind of what happened. Except, I’m proud to say—I did keep a smile (albeit sometimes fake) on my face the whole time. That was in part due to the fact that Jessica had invited her favorite babysitters, who stayed upstairs with me and helped out. Downstairs was a little rougher. One of Graci’s friends got so overwhelmed by the amount of kids in a small space that she went to Graci’s room and burst into tears. It was that bad. When it came time for the movie, we gathered everyone into the family room downstairs and projected it onto the wall. I could see the terror on Jer’s face when I passed out ice-cream sandwiches, popcorn, and m&ms to all the kiddos. It was so crowded that several of the kids wandered upstairs and I ended up playing games with them in the kitchen. Which was actually quite fun, and at least I didn’t have to stay downstairs and breathe the smell of 50 children in a small space. I hereby vow NEVER to combine three parties into one again, unless I am CERTAIN that the weather predicts blue skies. 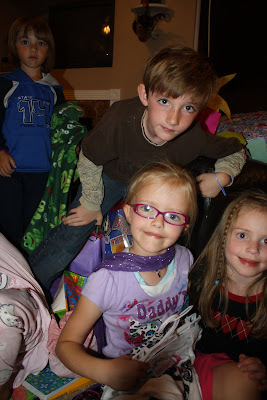 Luckily, our kids thanked us for the party and seemed quite happy about the whole thing. After all, they had friends and presents—all that matters, right? Sorry, I couldn't help but LOL. You guys are such troopers and amazing parents. The kiddos are so blessed and lucky to have you!!!!!!!!!!! And you did get through it and live to tell about it. Get well soon!!! You get a GOLD medal in Parenting for this party. Wow. I sure I would have been hysterically laughing and crying at the same time. I hope you are feeling better soon. We can't wait to see you!!!!!!! Seriously...where do you come from??? You are the cutest mom ever and so accommodating to have all those kids over and party hardy! A post a day...this is AWESOME! You poor things with that party! I can't even imagine. Isn't is amazing how the mere passage of time renders some things hilarious instead of horrific? holy moly. That's like a whole PRIMARY in your house! I hope that Mucinex helps! It helped me a few months ago when I had some crud I couldn't get rid of.